O’Grady’s Landscape specializes in outdoor fireplace design and installation for homes throughout Vienna, VA. We can bring the warm glow of a fire to your backyard or incorporate it into a complete patio design to create the perfect space for outdoor entertainment. You may also want to think about including your fireplace as the focal point of your patio space or adding an arbor around it to complete the look in style. If you need any help with the selection process, don’t hesitate to ask—our landscape designers have years of experience creating beautiful outdoor fireplaces for all types of properties throughout the Vienna, VA area! When you want to renovate your landscape in Vienna, VA, contact O’Grady’s Landscape. We have years of experience and expertise designing and installing all types of custom hardscapes, including outdoor fireplaces, so you can be confident that the final product will be a result of thoughtful design and careful craftsmanship. Your neighbors all over Vienna, VA choose O’Grady’s Landscape for all their landscape design needs. 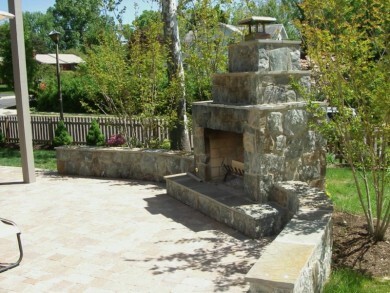 Contact us for your outdoor fireplace design and installation project, and see the difference for yourself!